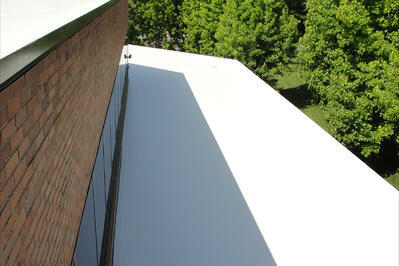 An aged EPDM roof substrate can greatly benefit from installing a preventative roof maintenance system. 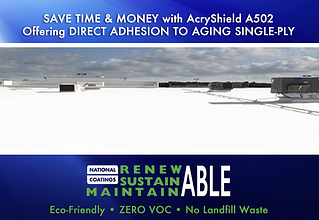 The AcryShield EPDM Roof Coating System can prolong the life-span of your existing EPDM roof, lower roof maintenance costs, decrease energy usage and costs and these EPDM roof coatings are renewable, indefinitely. The ease of application and non-intrusive application process for installing one of these systems makes them attractive to both building owners and contractors. With minimal noise disruption – no drilling, nailing or seam-welding necessary, ZERO or ultra-low VOCs, no harmful or strong odors, your company can remain open and conduct business as usual with minor distractions. Before application begins, all surfaces that will receive the AcryShield EPDM roof coating system need to be clean and smooth – free of moisture, dirt, debris and any other contaminations. All roof penetrations, mechanical equipment, cants, edge metal, and other on-roof items need to be established that they are in place and secure. Drains need to be cleaned and in working order. The surrounding areas, air conditioning systems, and air intake vents in the immediate vicinity of the coating system need to be protected and/or closed from over-spray. Surface Preparation In order to prepare the surface of the roof and insure it is clean and smooth for proper adhesion of the coating, the following may be necessary - an industrial cleaner, scraping, power brooming, vacuuming or other means to remove the debris. Pressure washing the rooftop prior to application of the EPDM roof coatings significantly removes extra dirt and debris; however, it is important to note areas of defect or leaks should be manually cleaned to avoid causing a larger issue. After the cleaning stage is completed you will need to seal and reinforce all loose seams and other failing areas specified by the coating manufacturer on the existing EPDM roof system. National Coatings recommends using either butyl seam tape or saturating 10” wide T272 polyester reinforcing fabric in AcryShield A502 base coat. HVAC duct work joints, mechanical equipment, coping seams and other critical junctures should be sealed with AcryFlex, an architectural sealant, and reinforced with polyester fabric or butyl seam tape. Skylights, equipment platforms and all other roof penetrations should be reinforced using 20” wide T272 fabric and AcryShield A502 base coat. The sealants and base coats will need 8 to 24 hours (depending on weather conditions) to dry thoroughly before application begins. After the entire roof field is cleaned, defects and seams are repaired, and custom reinforcement has been installed, the application process begins. A base coat is installed across the rooftop. The AcryShield A502 base coat is ideal for coating single-ply as it was specifically made to tenaciously adhere to hard to coat surfaces such as EPDM, while eliminating the need for additional primers or etching rinses. After the base coat dries, which takes 8 to 12 hours, a topcoat is applied. The AcryShield A500 topcoat is supreme as it provides longevity, brightness, superior dirt pick-up resistance and protection against biological attach, such as algae and mold. The A500 exceeds all ASTM D6083 requirements and also offers excellent tensile strength, elongation, and wet adhesion. Once the topcoat dries, roughly another 8 to 12 hours, the EPDM roof coating system is complete and can be exposed to foot traffic. Contact National Coatings for a detailed installation specification for EPDM Roof Coating Systems for further information on required gallons per square feet, dry mil thickness and other important application requirements.